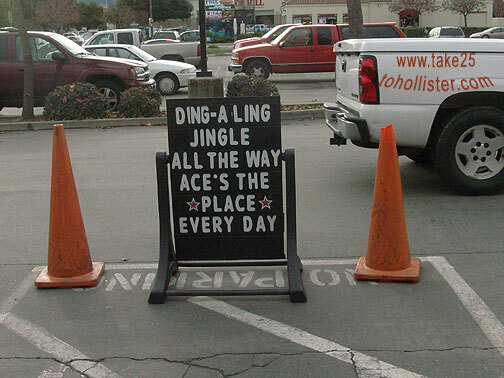 If you had a camera, could you resist taking this sign as you came out of Ace Hardware Store? Okay, you ancient ones out there: Was Brown and Chappell a hardware store? And, before it moved to Cushman Street, where was it downtown? No, I don't have the answers. I just want to know because I'm driving myself nuts trying to remember. 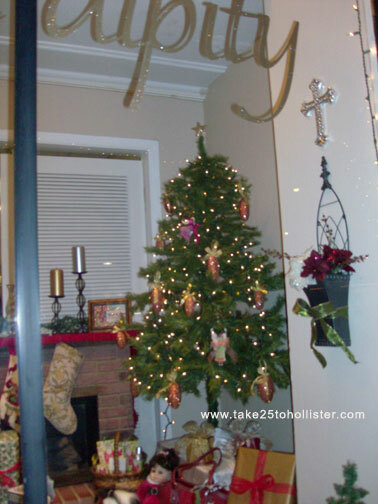 Christmas is a few days away. Still stumped about what to give as presents. How about chocolates and jelly beans that are made within our own county? If you haven't tried any of Marich Confectionery's goodies yet, what are you waiting for? Truffles, yum. Malt balls, yum. Chocolate-dipped nuts, yum. Jelly beans, yum....Excuse me, for drooling. You can buy online, but at this late date, you might want to go down to the factory. Marich has a small shop to the right of the lobby. 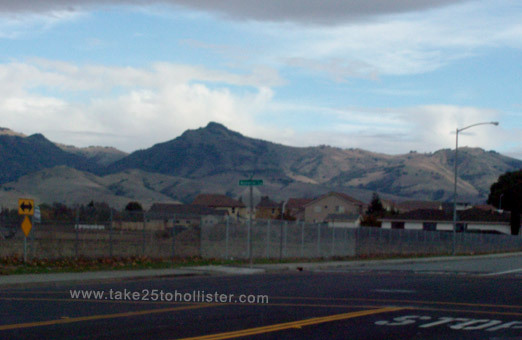 It is located at 2101 Bert Drive, which is off of Fallon Road across from the Hollister Municipal Airport. Here's a fascinating fact about the company, which was established in 1983. The founder was Marinus Van Dam, who was the creator of the Jelly Belly beans. Yes, I'm talking about the infamous jelly beans manufactured in Fairfield, California. It was Mr. Van Dam, an employee of the Jelly Belly who had the know-how to come up with the why-to's, how-to's, and where-for's for mass producing the tasty, high quality jelly beans that are sold around the world. 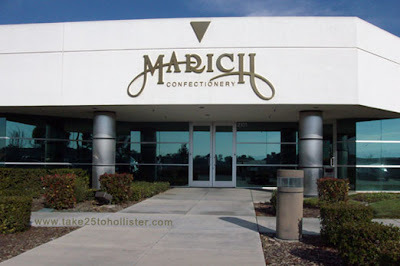 Here are some links to learn more about Marich Confectionery. And, no, dear Take 25 readers, I was not paid nor given freebies to write about Marich Confectionery. Chocolates, yum. Drooooooool. 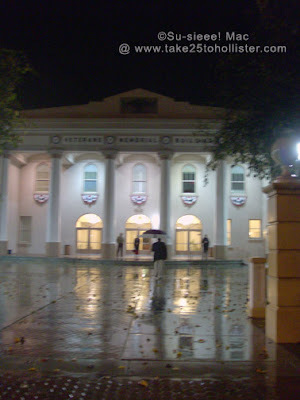 The Veterans Memorial Building in downtown Hollister is used for public and private events throughout the year. Last Saturday, for instance, the Filipino American Community of San Benito County held its annual Christmas Ball there. Have you heard? Mrs. Santa Claus is coming to town. 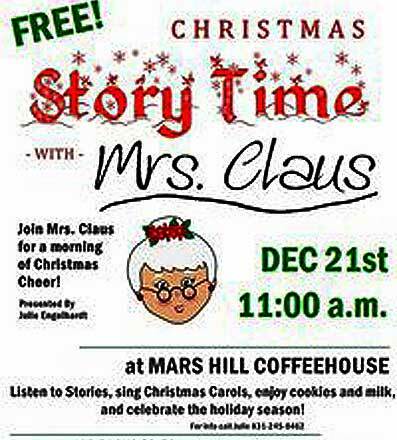 She'll be reading Christmas stories and leading Christmas carols this Tuesday, December 21, at the Mars Hill Coffeehouse on San Benito and Sixth Streets. 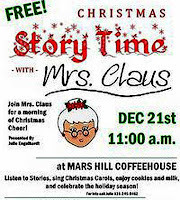 Story time begins at 11 a.m. The event is free. Kids of all ages are invited. Disclaimer: The real Mrs. Santa Claus will not be able to make it on Tuesday. She's very busy helping Mr. Claus get ready for his big trip this coming Saturday. To represent her is a very nice local helper by the name of Julie Engelhardt. For more on our own Hollister "Mrs. Santa Claus," please click here. Sparkle, sparkle. Sprinkle, sprinkle. Swissssh, swissssh. Saturday evening in downtown Hollister. Unfortunately, we don't have that many clothing stores in town. But, the few independent shops that are in town offer quality goods. She's on San Benito Street, across from the Veterans Memorial Building, is such a one. The shop sells women's clothing, jewelry, shoes, and other accessories. 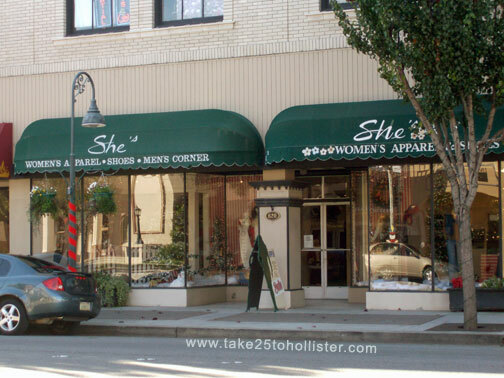 As the the sign says on the store awning, there is a men's corner, and it is just that. She's resides in what was once Ladd Hardware. I'm sure many of you baby boomers and older folks who grew up in the area remember the store. No, you're not crazy. 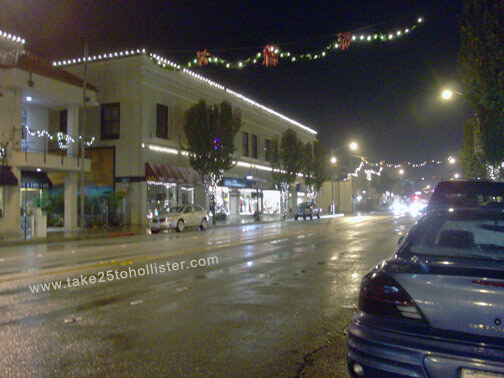 The Christmas decorations are still hanging over the main street of downtown Hollister. This photo was taken in April of this year. Anyone remember when the only traffic lights in town was at the intersection of Fourth and San Benito Streets? 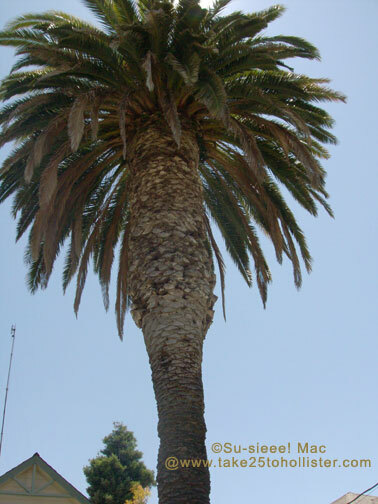 Doesn't this palm tree on San Benito Street look like Sideshow Bob on the Simpsons? Here's a different view of a familiar local site on San Benito Street. This archway leads into the hall of the San Benito Lodge #12 of the Free and Accepted Masons (F. & A.M.). Beautiful dress, don't you think? 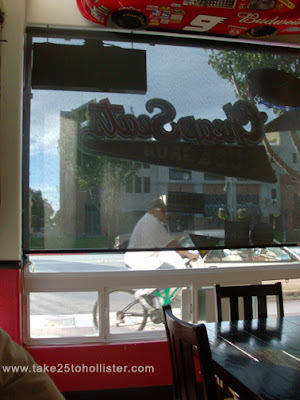 Whether I'm driving, walking, or pedaling my bicycle, I like to peek in the windows of Novias La Princesa whenever I go by it. I'm bound to see new formal dresses which look like ones that Cinderella might wear to the Prince's Ball. You can't miss this dress shop It's the store beneath the tower clock, at the corner of Fourth and San Benito Streets. Do you like a discount on merchandise, service, or a meal? Would you like exclusive discounts to Hollister shops, restaurants, and other businesses? 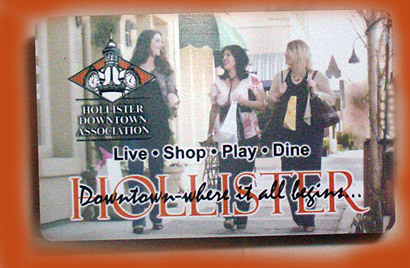 Well, then, apply for a Downtown Club card, sponsored by the Hollister Downtown Association. Using the card allows you to get discounts from businesses that are members of the association. There are new discounts every month. For example, during the month of December you could get a 15 percent discount on your paint purchase at the Hollister Paint Store, 10 percent off your meal at Knife and Fork, and take a free trial dance or music class at the West Coast Music and Dance FX. The Downtown Club card is free, and it is good for a year. But, there is a catch. Only 1,000 cards are available. It's first come, first served. So, don't be a procrastinator. For further details, go to this page at the Hollister Downtown Association Web site. 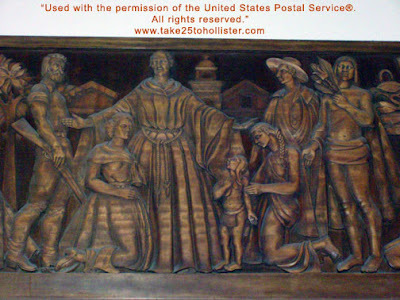 This wooden mural hangs in the Hollister Post Office near the counters. It is called the "History of San Juan Bautista Mission" and was created by Vladimir Nemkoff, along with his assistants Joseph Stone and Avis Zeigler, in 1936. The mural was commissioned for the old post office building on Fifth and East Streets. I always thought the mural was done by artists working for the Works Progress Administration (WPA). Nope. The piece was part of the U.S. Post Office New Deal artwork, which was funded through the Section of Painting and Sculpture of the U.S. Department of Treasury. It's nice to learn something new. 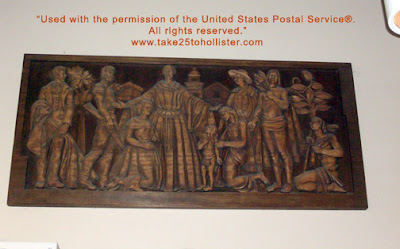 For more about U.S. Post Office New Deal artwork, check out "Off the Wall: New Deal Post Office Murals" by Patricia Raynor. 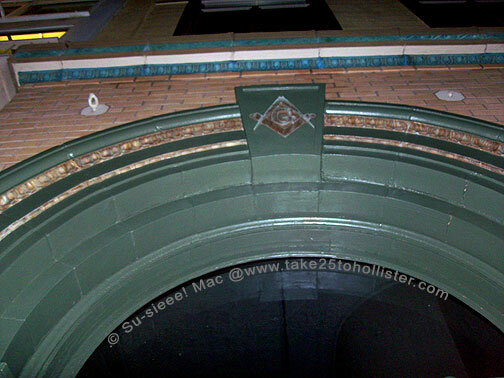 A closer look at a segment of the mural. See the mission in the background. This photo was taken from inside Cheap Seats Pub and Grub on San Benito Street back in November. A happy, friendly place to drink a beer and eat some jalapeño poppers. Check out the reviews of the establish at Yelp. 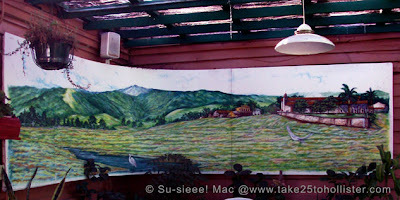 Hanging in the patio at Doña Esther, a Mexican restaurant in San Juan Bautista, is this beautiful mural that depicts how San Juan Valley looked during the mission days. Take a look at the mural, the next time you're in the mission city. Serendipity is a new gift shop in town. It is located at 616 San Benito Street, between She's and the coffee house. 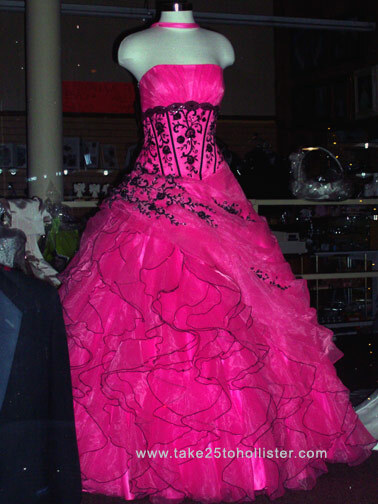 I took the photo of Serendipity's display window on the night of the Lights On Celebration parade. Tonight the Watsonville Band will be performing its annual Christmas concert at the Veterans Memorial Building on San Benito Street. It will start at 7:30 p.m. And, it will be free! The Watsonville Band is composed of musicians from San Benito, Monterey, Santa Cruz, and Santa Clara counties. For more about the band, click here. To read about a past Christmas concert of the band, please click here. Meridian Street and Memorial Drive. Here's how the range looks from San Juan Valley. The peak on the right is Santa Ana Mountain. 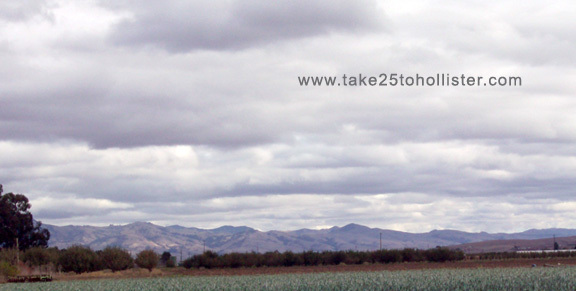 San Benito County is bordered to the east by the Diablo mountain range. 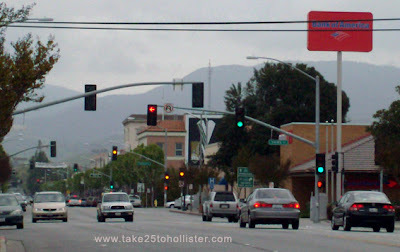 The 3,000+ feet peak Santa Ana Mountain overlooks downtown Hollister. The views up there are awesome at anytime of the year, as is the drive on Lone Tree Road to get up there. Unfortunately, no public trails are available. This photo was taken on the night of Lights On Parade. I can't remember where, other than it was on San Benito Street. A cute display, don't you think? If you're in the mood for some Jingle Bells as performed by Glenn Miller, click here. If you're not in the mood for reading (though I don't see why not), just scroll on down to the bottom. 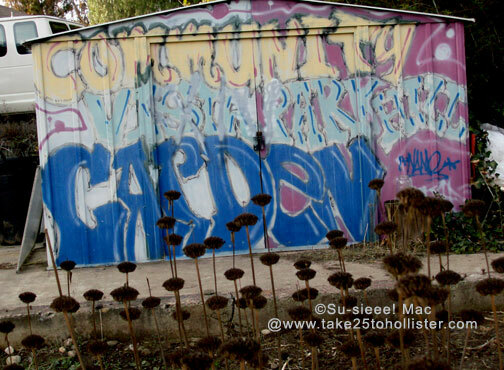 Did you know that there's a community garden up on Vista Park Hill in downtown Hollister? The gardening plots are free and open to all. Bidding for plots usually takes place in January. Contact the Hollister City Hall for information. For more about the community garden, check out these two news articles that were written a few years ago. 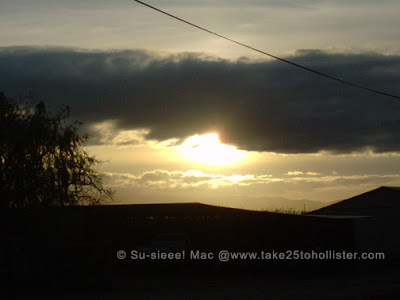 I came across this video a few months ago at the Web site called San Benito Now. I think it is part of the local government's efforts to bring companies into the county. What do you think? Will it do the job? 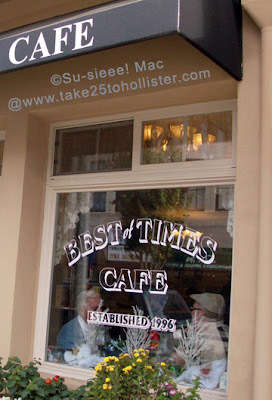 The Best of Times Cafe is on the east side of San Benito Street, between 6th and 7th Streets. It opened in 1996 as the Hard Times Cafe. The owner changed it in 1999 because a chili restaurant franchise on the east coast has a trademark on the name. Want to know more? Read "It's the Best of Times for the former Hard Times Cafe", by Kollin Kosmicki in The Weekend Pinnacle Online. The cafe recently received second place in the Best Diner category of The 2010 Pinnacle Awards. For customer reviews, check out Yelp. I'm not a minestrone fan, but at Best of Times Cafe, I'll order it!. San Juan Valley, a few miles northeast of the mission city. My dad was an irrigator for various farmers in San Benito County for almost 30 years. When I was a child, my dad and the fields were my babysitters. I loved going with him every day to the best play grounds around. I still have a thing for fields. 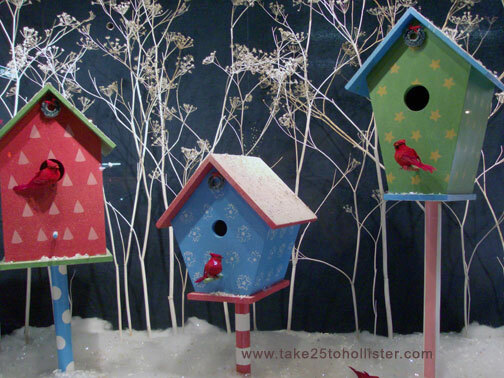 Are you looking for homemade crafts and food products to give as gifts this year? Especially items made by local craftspersons and foodies? 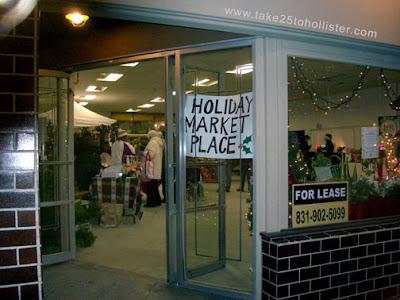 Check out the Holiday Market Place on the corner of San Benito and South Streets. Local artisans will be selling their wares to the public at the site every Friday, until Christmas. 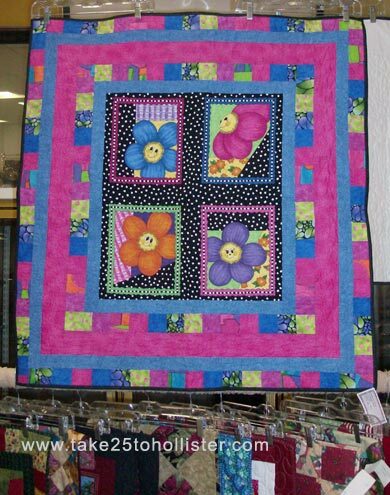 This lovely quilt is by Juli Ann/Snuggly Babies. and the Last Stitch in San Juan Bautista. The joint was open after the Lights On Celebration parade last weekend. It was jumping! 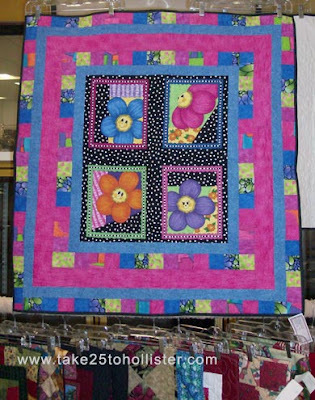 Quilts, jams, chocolates, purses, jewelry, and knit scarves were among the various items that were on sale. What items will be on sale each Friday will depend on the vendors. If their is a positive response to the venue, it may also be open on Saturdays. So, spread the word, folks!